A show lead differs from an ordinary lead in that it is collar and leash in one. Essentially, a show lead is two loops separated by a cord, rope or leather band. When you put one loop through the other, you create a collar that you can slip over your dog's head, leaving the other loop as a handle for you to grip. 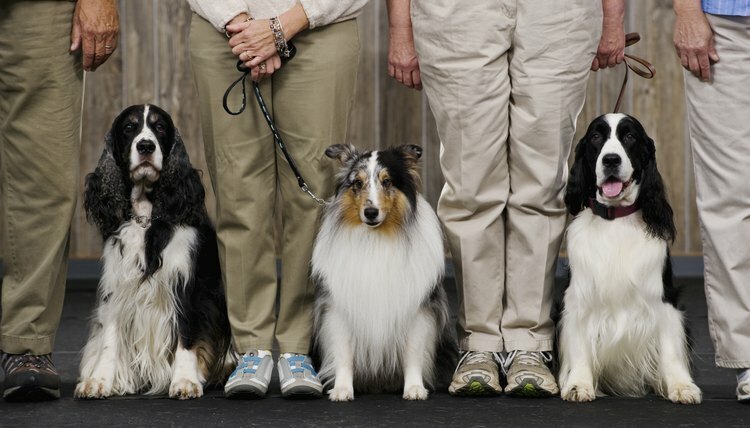 Show leashes allow dog owners to quickly slip on a lead for showing, and will not muss the hair of long-haired dogs as much as other lead-and-collar combinations often do. Cut a piece of hollow braided nylon rope with a knife or scissors to the length you prefer for your dog lead, plus about 24 inches extra. Melt the ends to prevent fraying, using a lighter or matches. Wear heavy gloves and pinch and roll the ends as you melt the material to form pointed ends. Loop one end of the rope back to a point 6 to 8 inches up on the rope length. Grasp the rope at that point with both hands and push it together so that it bunches up a bit and leaves some slack in the braiding. Work the pointed tip of the rope into an opening in the braiding there and up through the hollow core inside the rope—alternately pushing the outside rope together and threading the inside rope up through the hollow for several inches. Optionally, you can use a fid from a rope-splicing kit—a sort of hollow, pointed tube that fits over the free end of the rope temporarily—to aid in working the ends back up into the body of the rope. If you use a fid, you can work it out of the rope between two strands when you're done. Repeat on the other end of the rope. Work the ends of the rope as far up into the center of the rope as possible, leaving a tight loop on one end, for slipping the other loop through to make the collar, and a larger loop as a handle on the opposite end. The rope ends will stay tightly in place due to the tension on the rope when in use. Measure, cut and seal the ends of the rope as if you were making a spliced lead, but do not point the ends of the rope. Coil one end of the rope back to form a small loop—with the end of the rope side-by-side with the body of the rope on a flat surface. Place the bottom half of a plastic two-piece double rope clamp under the two lengths of rope, adjusting them so that each lies in the proper channel and the end of the rope does not protrude from the bottom of the clamp. Set the top half of the clamp over the bottom, sandwiching the rope in between. Then fasten the screws of the clamp until the two halves join tightly together around the rope. Repeat the process on the handle end of the lead, being sure to make the loop large enough to insert your hand.